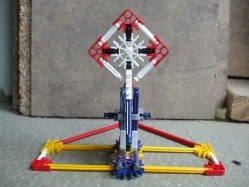 Using just 72 knex pieces this is a piece efficient target which is very effective. It is balanced delicately so that the slightest knock by a bullet causes it to fall down. A great game would be to play against a friend taking it in turns to hit the target from perhaps 20ft away. Enjoy!